When was the last time that you heard a little girl make that statement? For that matter, when was then last time that you heard any child make that statement? In many urban areas, including the nearby cities of Oakland and Richmond California, law enforcement officers are the enemy. It’s not my job to get into the politics of why this is so – and that discussion could fill an encyclopedia’s worth of volumes. What I would like to talk about is how you can make a law enforcement career seem pretty cool to the “iPhone and Android generation.” If you haven’t yet heard of S.T.E.M. (or STEM), now is the time to learn about it. STEM stands for Science, Technology, Engineering and Mathematics – educational areas where the United States is falling behind the rest of the world and industries where women, Latinos, and African-Americans are at the end of the pack. Many technology companies, such as Oracle, Honda, and Toyota, along with dozens of public organizations offer STEM grants to communities throughout the United States. But you don’t need to fire up your own program because for the past 31 years, the Science Olympiad has led a revolution in science education. Unlike static science fairs with tri-fold cardboard popups and baking soda volcanoes, Science Olympiad competitors need to solve real-life problems while the clock is ticking. One of my favorite competitions, and one that I have judged a number of times, is Forensics, where two students from each team first need to determine if a crime was committed and then “whodunit.” Tests include lifting prints (and explaining how to lift them from various surfaces), reading blood spatters to determine their trajectory, matching DNA and spectrometer plots, and determining the origin of various fibers and hairs. This is science that is much more fun than a cardboard tri-fold and which teaches real-world problem solving. If I showed you photos of the events that I have judged over the years, what will pop out is that over 90% of the competitors are East-Asian or Indian with a smattering of Whites, a handful of African-Americans, and very few Latinos. What also will surprise you is that over 60% of the participants in my events are female. In my day job consulting on disaster recovery services to enterprises, I have a mantra of, “Crawl, Walk, Run.” If you already have a local Science Olympiad group that your department can join, that’s great. But if not, you can start as small and as local as you like. In my own California county of San Mateo, the Office of Education has a robust STEM program, with a specific program targeted at girls. San Mateo County Sheriff Greg Munks is committed to diversity in his ranks and is proud to have women at every level of command, from correctional officers to deputy sheriff, sergeant, lieutenant, captain and finally, assistant sheriff (one of whom is Trisha Sanchez, pictured to the left). His organizations’ support of the STEM program includes staff and materials for teaching these young ladies what being a deputy sheriff is all about. Through a partnership between the San Mateo County Sheriff’s Activities League and the advertising technology company Rocket Fuel, 50 third- through sixth grade girls, half from schools in East Palo Alto and half from Garfield Community School in Menlo Park spent the eighth day of 13 STEM sessions learning about being a woman in law enforcement. 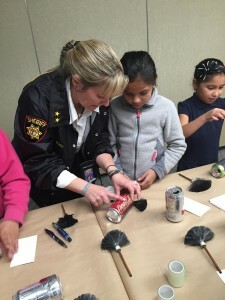 Deputy Rosemerry Blankswade and Assistant Sheriff Trisha Sanchez discussed examples of some of the different specialties and tasks the young ladies could pursue including working as a K-9 handler, motorcycle officer, detective, a crime lab technician, lifting latent prints and pulling DNA samples, or even using a radar gun on patrol. The session ended with the assistant sheriff and deputy encouraging the girls to stay in school and excel in their studies, swearing them in as honorary sheriff’s deputies and inviting them to join the Sheriff’s Explorer Program when they turn 14. 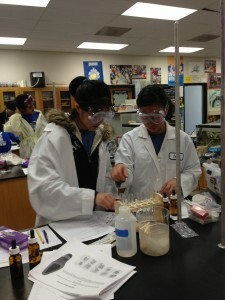 Does your department have an Explorer program? Do you reach out to children before gangs can get to them? Do you work with your local community leaders to help keep kids in school and encourage them to excel in their studies? Please let me know in the comments. © 2019 seacliff partners international, LLC. Design by Free CSS Templates.